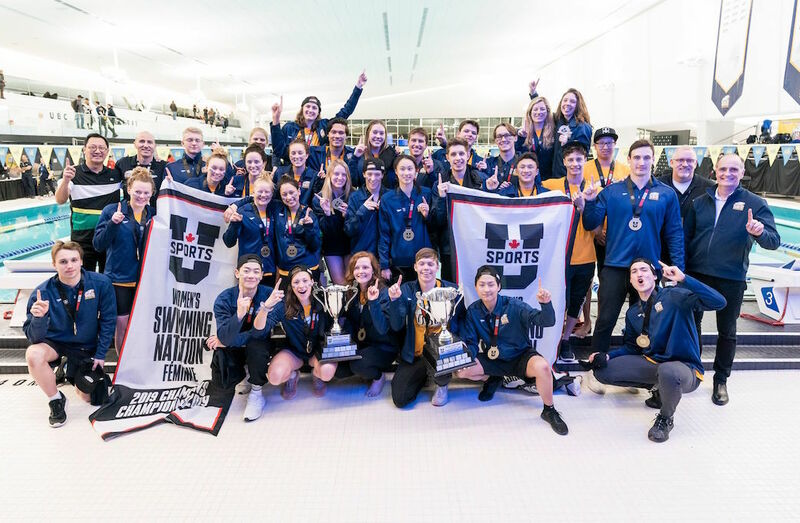 The UBC Thunderbirds won both the men’s and women’s national titles at the 2019 U SPORTS Odlum Brown Swimming Championships for the third consecutive year. With the home pool victory, the UBC women have now captured seven titles in the last eight years, while the Thunderbird men collected their fourth of the last five national championships. UBC secured the women’s championship with 1,255.5 points, edging out the Toronto Varsity Blues (1,230.5) in an electrifying final day at the UBC Aquatic Centre. The Montreal Carabins finished third with 701 points, followed by the Calgary Dinos (521) and the Victoria Vikes (312). The men’s standings also came down to the wire, as UBC (1,075 points) came from behind to top the Calgary Dinos (925.5) on Day 3. The Toronto Varsity Blues were third (682), McGill fourth (550) and Victoria fifth (472.5). RECORD ALERT! @MarkusThor2 breaks @USPORTSca record on his way to winning gold in the 100m freestyle in 48.71. After a meet that saw 21 U SPORTS records broken, Price shared the women’s Fox 40 Coach of the Year award with Toronto’s Byron MacDonald, and Calgary head coach Mike Blondal earned the men’s Fox 40 Coach of the Year honours. U SPORTS Male Swimmer of the Year Markus Thormeyer set his fifth U SPORTS record of the meet with a personal-best time of 48.71 in the men’s 100m freestyle, also earning his sixth meet record in the 200m backstroke (1:58.64) for his third straight gold in the event. The third-year ‘Bird joined Alexander Pratt, Josiah Binnema, and Araya Therrien to secure the 4x100m freestyle relay in yet another U SPORTS record time of 3:23.39. In her last national university meet, 2016 Olympic medallist Kylie Masse completed the backstroke triple grand slam in record-breaking fashion, securing the 200m backstroke gold in a new U SPORTS best time of 2:08.70. It was the fourth 200m backstroke gold of her university career, to go with four in the 50m, and another four in the 100m. Eleven of those 12 wins came in U SPORTS record-setting fashion. The former world record holder concluded her career at the University of Toronto as the U SPORTS Swimmer of the Year for the fourth consecutive season. 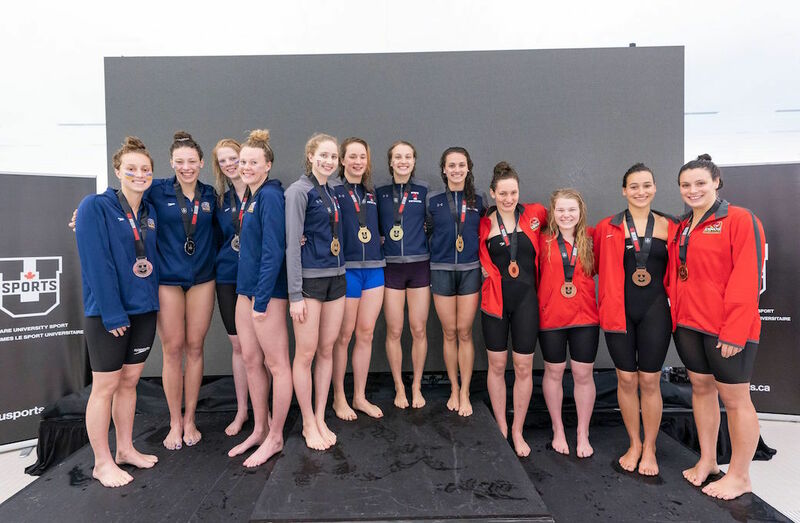 Masse swam one last race with her Toronto 4x100m freestyle team, and set a final U SPORTS record time of 3:43.90 with Aleksa Gold, Ainsley McMurray and Rebecca Smith. Smith, who was named Female Rookie of the Year, won the 100m freestyle in 55.45 for the Varsity Blues on Day 3. Male Rookie of the Year Alexander Pratt finished the meet with two individual medals and three U SPORTS records with the UBC relay teams. Victoria’s Taylor Snowden-Richardson and Lethbridge Pronghorn Owen Guyn took home the Student-Athlete Community Service Awards. UBC’s Emily Overholt crushed the U SPORTS 800m freestyle record by almost 10 seconds, touching the wall with a time of 8:46.89 for her fourth gold medal, and fourth meet record of the weekend. RECORD ALERT! @overholtemily smashes another @USPORTSca record by over 11 seconds - finishing the 800m freestyle in 8:46.89. Manitoba's Kelsey Wog completed the breaststroke sweep by defending her gold medal at the 200-metre distance in a new U SPORTS record time of 2:25.50 – taking home top spot in the 50m breaststroke, 100m breaststroke and 200m individual medley. Ottawa’s Davide Casarin set a new U SPORTS record in the men’s 200m butterfly (2:00.41), while the Thunderbirds filled out the podium with Josiah Binnema in silver (2:00.95) and rookie Dmitriy Lim in bronze (2:01.16). Second-year Thunderbird Jaren LeFranc impressed in his 200m breaststroke gold-medal swim (2:16.41), finishing nearly two full seconds ahead of Sherbrooke’s Jonathan Naisby (2:18.39). Calgary’s Benjamin Blackmon snagged bronze in 2:19.17.